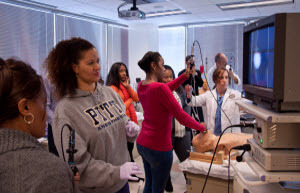 WISER - Pitt School of Nursing and WISER host Nat'l Diversity in Nurse Anes. My Portfolio > Article Archive > Pitt School of Nursing and WISER host Nat'l Diversity in Nurse Anes. 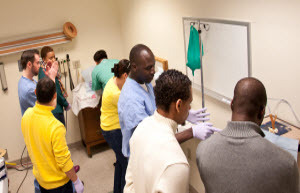 On March 1-3, 2013, the University of Pittsburgh School of Nursing and WISER collaborated to host the National Diversity in Nurse Anesthesia Mentorship Program. This event brings together Program Directors, CRNA's, SRNA's and Nurses for an informative and interactive weekend of socialization and skill development. The event began Friday March 1st with an informal "Meet and Greet" reception to introduce the attendees to panel participants and Program Directors (John O'Donnell, University of Pittsburgh, MaryBeth Massie, University of New England, Marjorie Geisz-Everson, the University of Southern Mississippi and Danilo Lovinaria, University of Minnesota). Saturday, March 2nd began with an introduction of the day's events by the SRNA moderator Ms. Tahirah Marks (University of Pittsburgh) with welcome from Wallena Gould CRNA, EdD, Founder and Director of the Diversity in Nurse Anesthesia Mentoring Program and Mr. John Bing CRNA, Chair of the Diversity in Nurse Anesthesia Mentoring Program Board of Directors. Dr. Jacqueline Dunbar-Jacob, PhD, RN, FAAN (Professor and and Dean, University of Pittsburgh School of Nursing) and Ms. Paula Davis, University of Pittsburgh Senior Vice Chancellor of Diversity in Health Sciences the welcomed more than 100 participants to the University of Pittsburgh. Panel discussions by student anesthetists and CRNA educators and clinicians were the main focus of the Saturday event. The SRNA panel consisted of 12 students representing various schools and levels in their respective programs. Questions pertaining to entry, preparation for and during the programs, a typical day as a student, clinicals, and balance of life and school, were fielded by the panel participants. The student moderator for the event was Ms. Tahirah Marks SRNA, BSN (University of Pittsburgh). Following the student panel was AANA President Mr. Dennis Bless CRNA, MS who described the state of the anesthesia profession and prospects for the future. Finally, a CRNA practitioner panel fielded questions on CRNA practice, national certification examination preparation, expectations of clinical preceptors and characteristics of successful students. Ms.Loren Pulliam CRNA, MSN and Loren Pulliam, CRNA, MSN, John Bing, CRNA, Captain Cesar Visurruga, CRNA, MSN and Bob Gauvin, CRNA, MS. Other University of Pittsburgh students who volunteered as mentors and facilitators included Jamal Hawkins, Thea Cole and Micheline Jeter-Ogagnan. 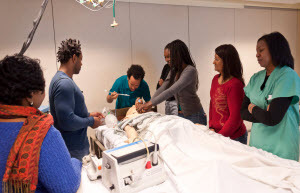 "The beauty of this event is the interaction between the participants and the CRNA's, SRNA's and Program Faculty. Everyone is approachable and easy to engage in conversation. To have this kind of information available to you is an amazing gift." Ms. Marks said of the event. 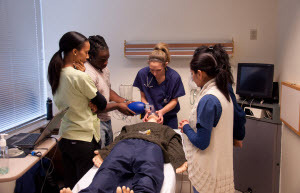 On Sunday March 3rd, a clinical skills and simulation session was held at WISER. The participants that attended were amazed with the facility. Activities included intubation (nasally, orally and with fiber optics), LMA placement, mask ventilation, spinal anesthesia, induction of general anesthesia and a personal interview with a CRNA educator. Instructors included SRNAs, Hideru Inoue, Dawn Mills, Michael Laughter, Audrey Miller , Kristin Adkins, Tahirah Marks , Lang Conteh, Joey Ferriero, Leah Ulizio, During the session, Dr. Lena Gould, CRNA, DNP and the founder of the mentoring program stated "the mission of the Diversity in Nurse Anesthesia Mentorship Program is to inform, empower and mentor underserved diverse populations with information to prepare for a successful career in Nurse Anesthesia." Ms. Gould has been recognized across the United States for her efforts by both Nurse Anesthesia and Nursing groups.